Does someone you know like chocolate? The perfect little present is wrapped up in this chocolate bar. 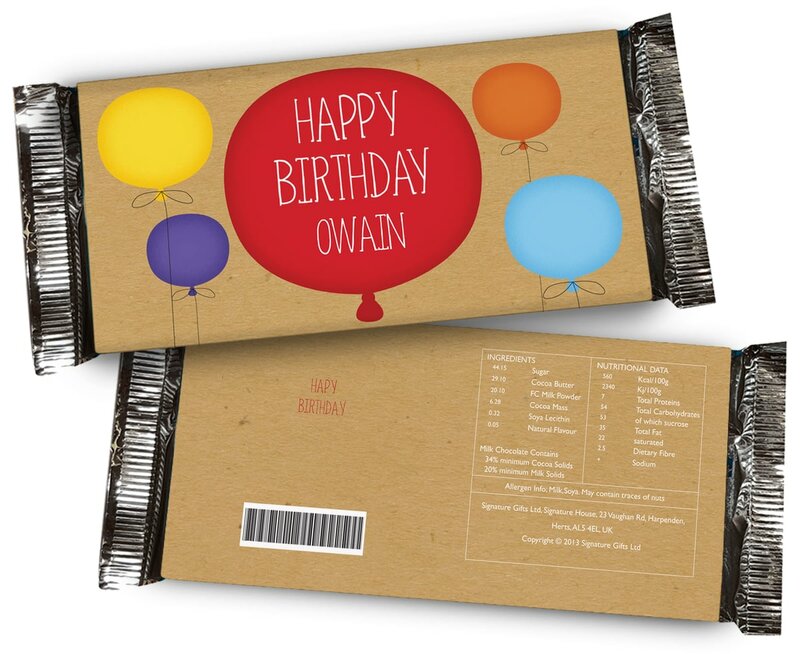 The inside is made of tasty milk chocolate, and the outside of the bar is wrapped in a personalised Birthday balloons design, incorporating the recipient's name, and your message on the back. Whether it's for your Mum, Girlfriend or just a friend, this bar is perfect for a chocoholic and says Happy Birthday in a tastier way than any card ever could. Make any milestone birthday one to remember with this brightly coloured chocolate bar. A different type of Birthday balloon on this wrapper helps you to wish her a happy Birthday. Let cheeky Chilli and Bubble help say 'Be My Valentine' to someone special.